An important part of our immune system is its ability to differentiate between normal, healthy cells in the body, and those that are cancerous. The major problem with cancer cells is that they often find ways to avoid being attacked by the immune system. Often, this occurs when they increase the expression of immunosuppressive proteins in the tumor microenvironment, such as PD-1 and IDO. Over the past 15 years, therapeutics specifically blocking immunosuppressive proteins to activate T cells and the adaptive immune response have demonstrated therapeutic efficacy in treating cancer. Building on that success, therapeutics targeting the innate immune system, such macrophages and dendritic cells, are under pre-clinical and clinical investigation. Immune Checkpoint Signaling Pathway. Check out the interactive version! Despite the unprecedented success of immunotherapy, scientists are still striving to do better. Not all patients respond to treatment, so scientists are trying to identify biomarkers that can predict whether a patient will respond to immunotherapy in advance. That way each person receives a personalized treatment strategy that is more likely to succeed. These so called predictive biomarkers could be the immunosuppressive proteins themselves, such as PD-L1, or it could be the accumulation of certain immunosuppressive cell types, such as tumor-associated macrophages also known as TAMs. Macrophages are critical to the development, maintenance, and also the eradication of cancer cells. In general, macrophages in the tumor microenvironment and at sites of wound healing can be polarized into two functional states: M1 or M2 macrophages. M1-polarized macrophages, referred to as classically-activated macrophages, are activated by cytokines such as interferon-γ, and they produce pro-inflammatory and immunostimulatory cytokines such as interleukin-12 and -23. Scientists have demonstrated M1 macrophages can have anti-tumoral properties, by scavenging and destroying phagocytosed tumor cells and stimulating helper T cell Type 1 responses. M2-polarized macrophages, also known as alternatively activated macrophages, are activated by cytokines such as interleukin-4, - 10, and -13. Most tumor-associated macrophages or TAMs are thought to resemble M2 macrophages. These cells play an important role in connecting inflammation with cancer. They express higher levels of anti-inflammatory cytokines, scavenging receptors, angiogenic factors, and proteases, than their M1-type polarized counterparts. TAMs can reprogram the immunosuppressive microenvironment and promote proliferation, invasion, and metastasis of tumor cells. They can stimulate tumor angiogenesis, and inhibit antitumor immune responses mediated by T cells. As the relationship between TAMs and malignant tumors becomes clearer, studies show they could be potential biomarkers for diagnosis, prognosis as well as therapeutic targets for cancer. For this reason, clear differentiation between M1 and M2 polarized macrophages is extremely important. 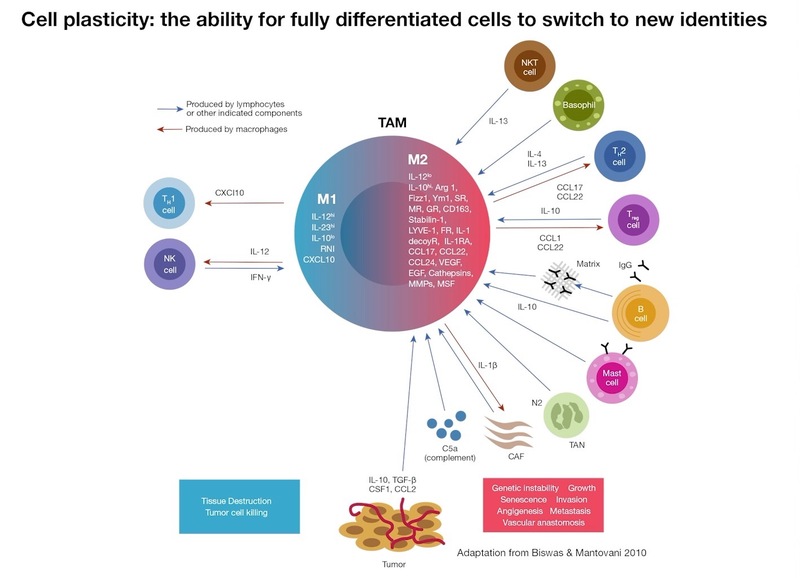 In reality, M1 and M2 functional states exist as two extremes upon a continuum, with the balance being tipped one way or the other by higher or lower levels of cytokines in the tumor microenvironment. In addition, macrophages are plastic, therefore M1 macrophages, given the right stimuli in the right environment can become more M2-like, and vice versa. This makes differentiating these cell types very difficult. More than one marker must be used to identify M1 or M2 functional states, so multiplex labeling by flow cytometry, immunofluorescence, or immunohistochemistry is likely required. While a few proteins unique to each functional state have been identified, scientists continue to struggle to search for better, more specific markers delineating the two. Many of the proteins controlling the functional state of macrophages are intracellular making extracellular labeling insufficient, so complex protocols combining intracellular and extracellular detection simultaneously are necessary. 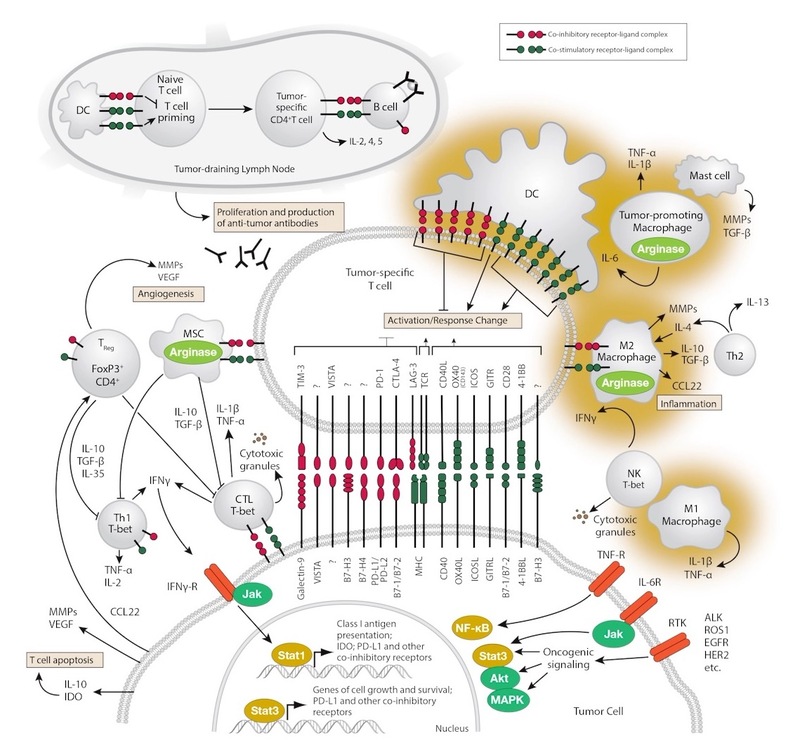 If it wasn't complicated enough already, several of the key proteins involved in M1 versus M2 functional states differ between mouse models and humans, making the translation of biomarkers from pre-clinical research to clinical application sometimes impossible. It is an exciting and challenging time for immunologists, and there is so much more to be done in order to understand the role of innate immune cells, in particularly macrophages, in cancer as well as various other fields of disease research. Thanks for watching. Please subscribe to our channel for more videos and visit our website for more information. We'll see you next time, good luck with your experiments!